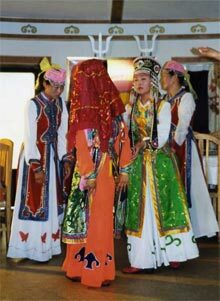 There are 2 kinds of important wedding ceremonies in Mongolia. One of them is the traditional wedding ceremony. Then couple wears traditional clothes called "Del". The Del is made from cotton and silk with patterns. The groom wears dark colored Del and the bride's is lighter. Another one kind of the wedding ceremony is the modern wedding ceremony. The groom dresses dark colored suit and the bride swears white colored gown. The weddings are celebrated in the restaurants, the wedding palace and at the homes. The groom's party almost pays the most of total finances for the wedding. The couple doesn't say wedding vows at the wedding ceremony. The groom's father says congratulations to the couple and after the congratulations the bride's father says the speech. The guests give to couple some presents, furniture, child's toys and money in the envelope. The groom's father or the special man chosen by the groom's father leads the wedding ceremony. There are songs, dances, jokes, meals, drinks at the wedding. The wedding usually continues for only 1 day in the cities. But, in the countrysides, it often continues for 3-4 days. The bride doesn't use the groom's name. The weddings are unforgetable ceremonies for couples in Mongolia. What could be a more adventurous start to your married life than a wedding in Mongolia? This little-known nation, located between China and Russia, is a treasure trove of breathtaking scenery and sacred Tibetan Buddhist sites. A traditional wedding in Mongolia is a pact between two families that is sealed by a civil ceremony. However, modern customs are now changing the face of urban weddings. The marriage may be celebrated in a special wedding palace, and the bride and groom will leave in a limousine. Guests will bring gifts and traditional or modern wedding outfits may be won. 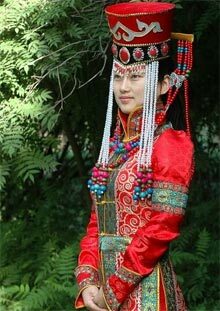 Traditional dress is a beautiful Mongolian tunic, made of raw silk, decorated with appliquéd brocade. This scenic country is proudly independent, with a dramatic history. Its intricate culture has been strongly influenced by Tibetan Buddhism. Exchange your wedding vows in Mongolia for an utterly unique beginning to your marriage. Khurim means wedding but also just feast. Gerlekh yoslol is a more general word for a marriage. Anyway, today there was a lot of weddings and feasts, as it was an auspicious day in the Buddhist calendar: Baljinnyam and Dashnyam coincide only once a year and it is traditionally the very best day to get married. From the early morning until late at night couples and their families were lining up for marriage ceremonies at the Wedding Palace. In conclusion, after the party, the bride belongs to the groom's family, and she will live with the groom for the rest of her life if nothing wrong happens to their life!! As we have seen the different way of wedding such as wedding in the air during sky diving, under water wedding in ocean during scuba diving, wedding in the highest peak of the world, Mt. Everest during expedition any many more unique ways to cherish the moment for lifetime. 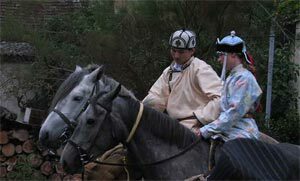 The traditional Mongolian wedding is one of those experiences to gather.